What can camping and adventures possibly have in common with the luxury-addicted? There is only one answer. And it’s quite the trend nowadays. It’s called glamping. 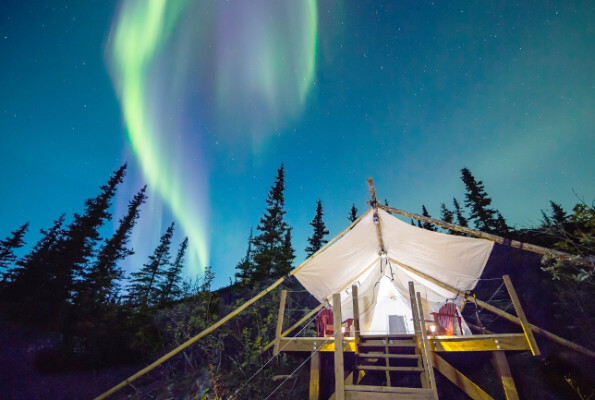 Glamping means experiencing camping in a very different way, it means going on a vacation and leaving everything behind us, in contact with nature but without compromising those small comforts that research and technology have made available to us in modern times, especially when it comes to housing. Glamping is camping in a small luxury housing units that are rigorously green-oriented, surrounded by designer objects with a high sustainability content. It’s a form of camping, yes, but geared towards wellness in a way that, instead of eliminating progress, is reintegrated in a tourist activity that is just as sustainable as it is comfortable. Glamping’s popularity is nothing short of a Copernican revolution in the way we think of camping, which from an “uncomfortable” activity (think, for example, of the back pain caused by sleeping on a tiny mat that definitely was not manufactured with ergonomics in mind) becomes comfortable, while respecting the environment and cutting down consumption to a bare minimum. What does the word glamping mean? The word glamping combines the words glamour and camping and stands for care, style and comfort infused in a traditional activity like camping. What can I expect to find at a glamping site? Nature, nature and again, nature. Plus, remarkable beauty and housing units that are rich in style, decorated with hand-crafted furniture and furnished with the latest-generation devices. The common denominator holding things all together is a rigorous respect for the environment: certified materials, circular economy of the partners, green power-generating systems. This is, after all, the new frontier in style, which is no longer luxury understood as flaunting superfluity but luxury as in quality, authenticity and sustainability. Care for details and quality, eco-friendly and hygienic materials, innovative transport systems that guarantee high energy savings, products modelled around the customer’s individual needs to offer unique experiences. If there is someone who’s been a glamping advocate all their life, is Magniflex, which always puts the needs of people at the forefront, takes care of their sleeping, uses the most advanced technology available in service of its customers’ wellness and does so while being mindful of their health and the environment. And it’s no secret that in a world as frenetic and noisy as ours is today, sleeping well is a true luxury! Is Jet Lag different when travelling from East to West? Sleeping helps you to lose weight: science has proven that!